Photos from 1-16-11 investigation. Read full report here. Tree formation. No tree balls (roots) or nearby trees as a source of these branches. Photos from 7-10-11 investigation. Read full report here. A small branch in the middle held this together. 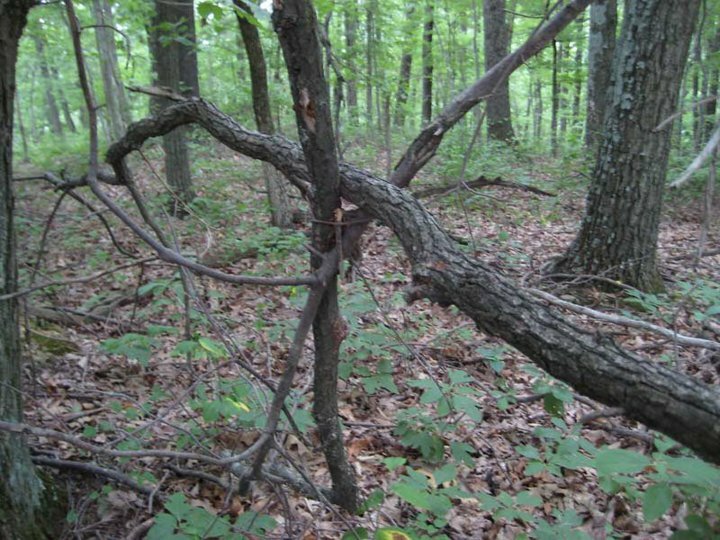 The larger tree (branch) on the right was twisted and bent over a game trail. 9-5-10 investigation. Read full report here. Around 1:00pm on a cool, sunny day, investigators (Dana and Charlie) drove to the exact location. In Brownsville, take Oak Hill Church Rd off of Main St to Mohawk St. Once on Mohawk Rd, we drove down a long, hilly country road to the second bridge. The forest in this region is very dense with many deep hollows. The Green River is only a stone's throw away. 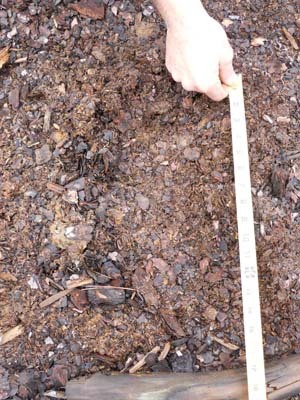 Plenty of deer tracks and groups of wild turkey were noted, indicating possible food sources. Upon arrival, we measured the width of the road and took photos of us taking large strides across the road. It took Dana 7 "long" strides to cover the span of the road. Dana is 5' 7" tall. 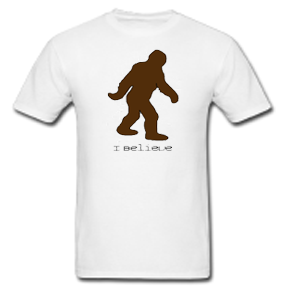 The bigfoot cleared it in 2 strides according to both witnesses. Afterwards we spent the afternoon zigzagging our way along this creek towards the Green River. A few questionable tree formations caught our attention, but nothing definitive. Many reports over the years have come from this area, so many that the locals call him "Big Moe". 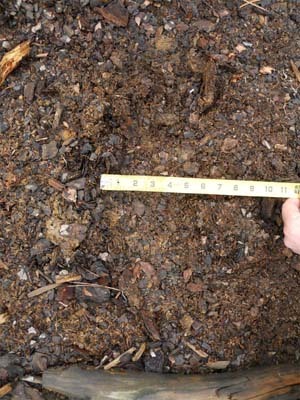 Investigated by Bart Nunnelly in 2006. Could this be a bigfoot tooth? 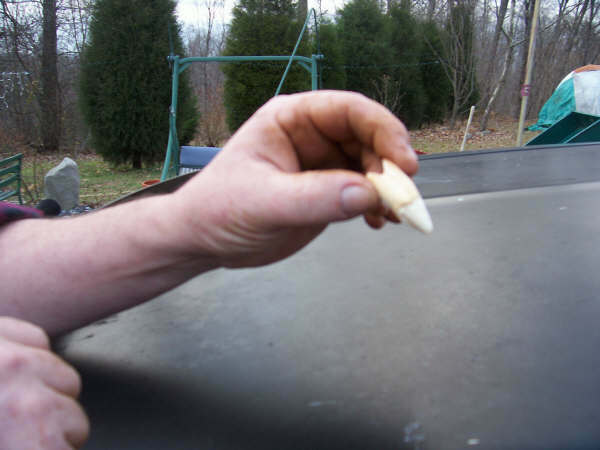 Longtime bigfoot witness, M. F. holds what he believes to be an actual tooth from one of the creatures that he found at the foot of an ancient Cherokee burial mound in Hebbardsville, Ky. This alleged bigfoot tooth resembles a human canine, only much larger. Throughout the 19th and early parts of the 20th centuries many many sources cite the discovery of giant human-like skeletal remains in the Bluegrass state, the vast majority having been found buried in Native American Indian burial grounds or mounds. 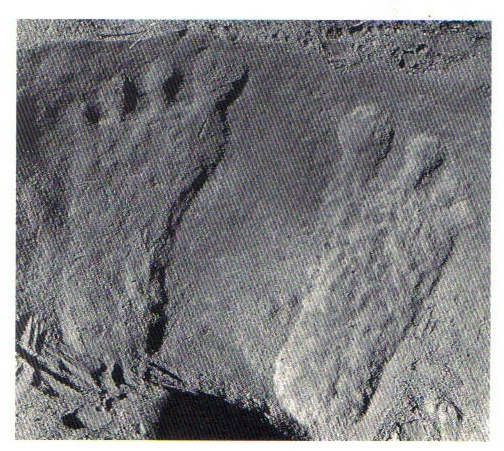 The witness' mother related to him before her death that she had personally witnissed the excavation of one such grave In Beals, Ky., between Spottsville and Reed, back in the 1920's. It was discovered during the process of building a bridge over a large creek. The bones were measured and found to be nearly 12 ft. tall! The giants remains passed into private ownership and their whereabouts went unrecorded. Witness hears a commotion outside his window and finds this print the next morning. Read full report here. From 1-10-10 investigation. Read full report here. Roll your mouse over each image. This is not the actual cast, just an overlay to show you the size. The wood chips and these pictures don't do it justice. Again, when I stepped next to the print, weighing 250lbs, my print was not half as deep as this print. Ancient evidence discovered at the Ledford Hollow Petroglyph Site. Read full report here.